All Globe and Flat-Earth Model Predictions are computed with my Curvature App. Please note that the horizon of the Flat-Earth Model always is at Eye-Level of the Globe Model. On the Globe the horizon is never at Eye-Level so all objects near or behind the horizon are below Eye-Level too. 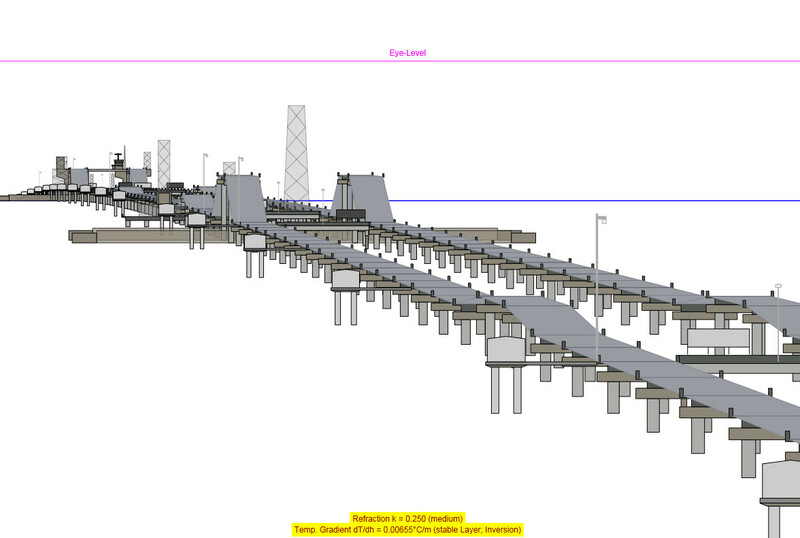 This scene shows the 38 km long Causeway Bridge at Lake Pontchartrain, Lousiana. 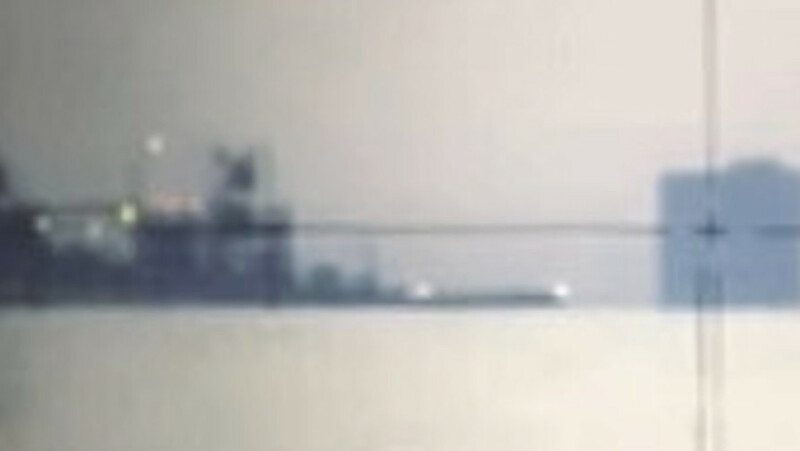 The image was taken from the 15th floor of the Marriott Hotel at the south side of the lake using a telescope with a zoom factor of about 2000 mm (35 mm equivalent). Note: please click the description below the image to open the Curvature App and load the corresponding simulation. Flat Earth Perspective (Flerspective) is a special kind of mapping of the 3D world onto a 2D plane like the sensor of a camera or the retina of the eye. There are variations of this mapping. They all have in common, that they do not conform with the real law of Perspective and are proposed by Flat Earthers as an attempt to explain observations. But as you can see, it does not match observations at all. See Flat Earth Perspective for informations about the implemented Flerspective model. If any Flat Earther can provide me a better mathematical model that "takes perspective into account" (the shown globe and FE model do take perspective into account, they are based on perspective), I'm happy to implement that model. Email me at walter@bislins.ch . 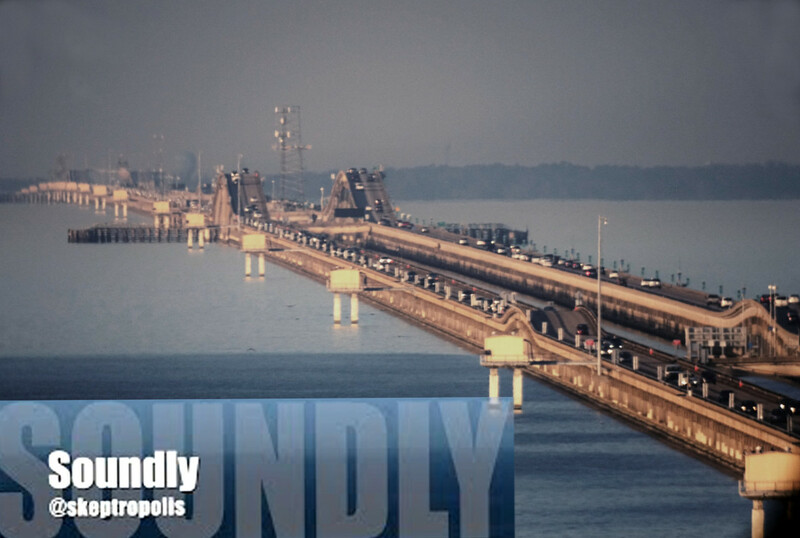 This scene shows the 38 km long Causeway Bridge at Lake Pontchartrain from the north side looking to the Marriott Hotel (Zoom about 3000 mm). Note that in the Theodolite View the horizontal line of the crosshair of the Theodolite is exactly at Eye-Level. 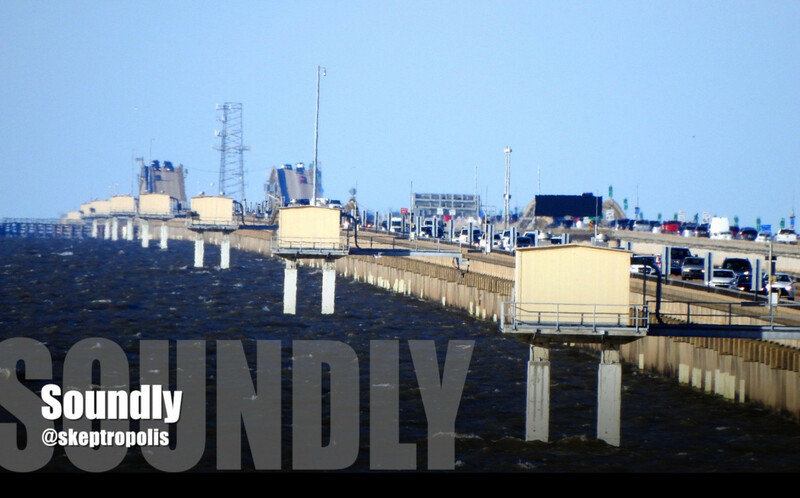 This scene shows one of the Lake Pontchartrain Transmission Lines, which crosses the lake in a perfectly straigh line. Over a distance of 25.9 km there are 85 identical towers with a separation of 300 m. The towers have a height of 23 m. The last 2 towers have a height of 64 m.
This observation from Miles Davis , like all other observations on this page, confirms without any doubt that the earth is a Globe. 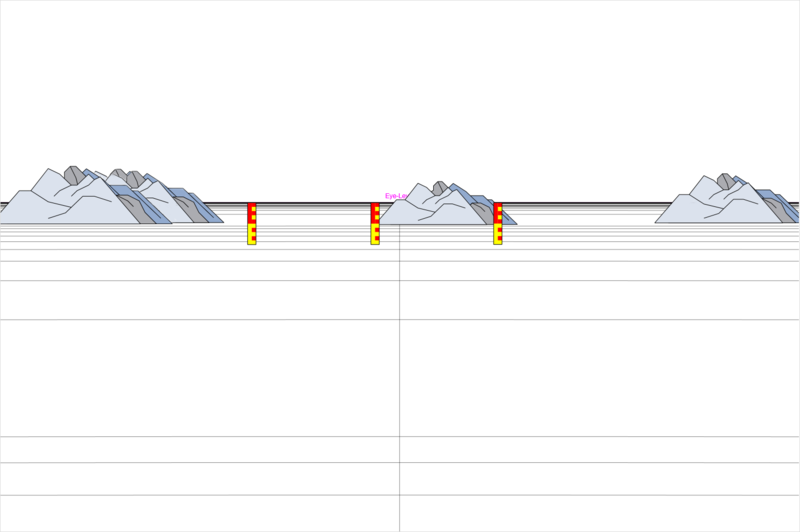 Miles Davis is at an altidude of 210 m. The middle bridge tower is at sea level and has a height of 210 m. All hills in the distance are far taller than 210 m but they appear below the 210 m line or only very slightly above. 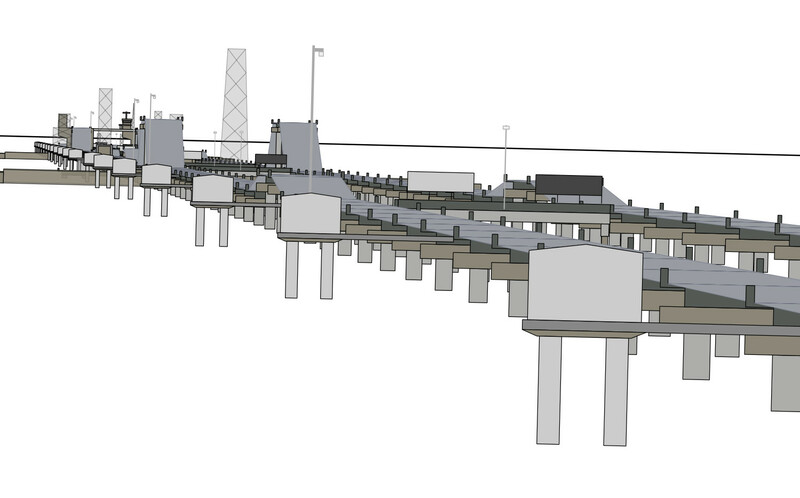 Note that the bridge towers and hills are all far below eye level. This can only be recognized in reality by using an auto level or theodolite. But anyway, the Flat Earth Model Prediction looks nowhere near like the image, while the Globe Model Prediction, using Standard Refraction, matches perfectly! 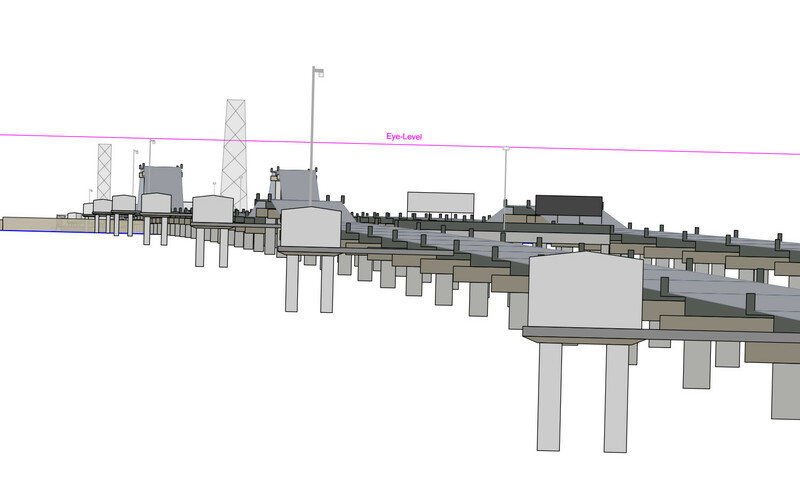 Note also, that even the bridge towers are the same height as the observer, they apear below eye level, because the earth curves down with increasing distance. You can click the links in the table below to open my Curvature App with the corresponding hill shown. You can than play with the settings. To change the transparency of the overlayed image, click on the image. Clicking left of the center makes it more transparent, clicking right more opaque. SidePos: is the horizontal distance from the center line of the image at the distance of the hill. 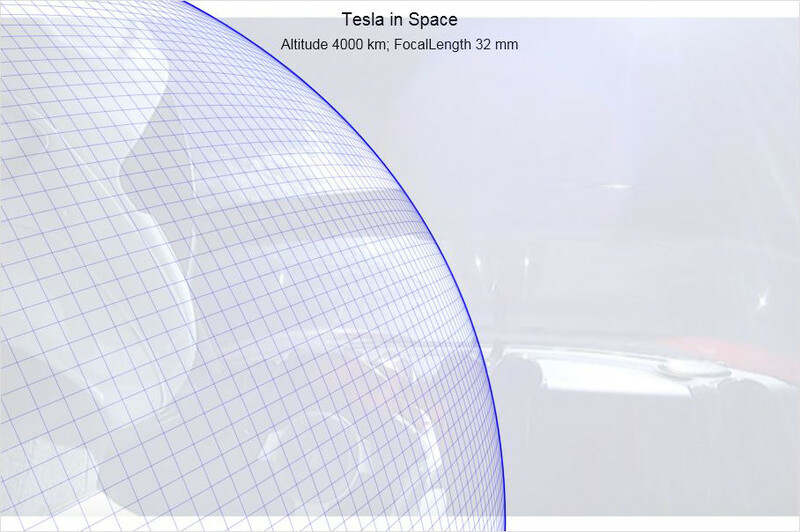 The observer Height in the Curvature App is set to 210 m and the Zoom to 420 mm. Standard Refraction of k = 0.17 is set. 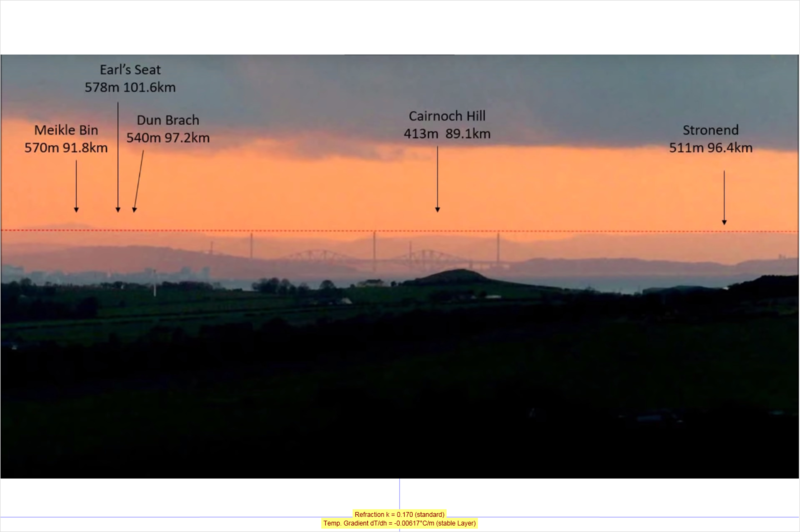 The measuring rods (bridge towers) are at a distance of 46.5 km from the observer and have a size of 210 m. Data providet by Miles Davis and confirmed by me using google earth. 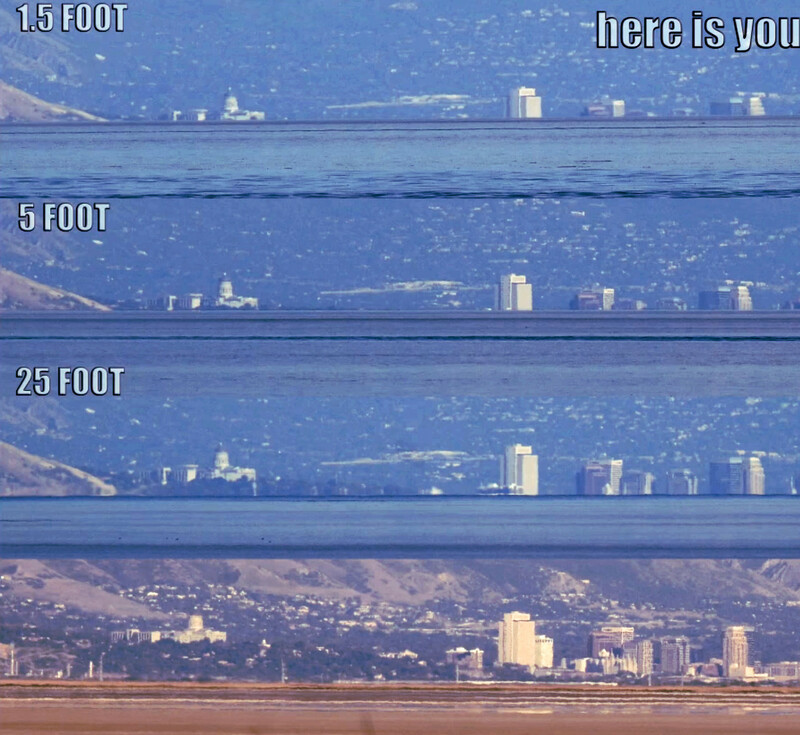 Observation of Salt Lake City from 40 km distance (top 3 images parts), showing how the water horizon hides the bottom part of the city as predicded by the Globe Model. The Flat-Earth model predictions do never hide anything of the city and do not match the footage at all. 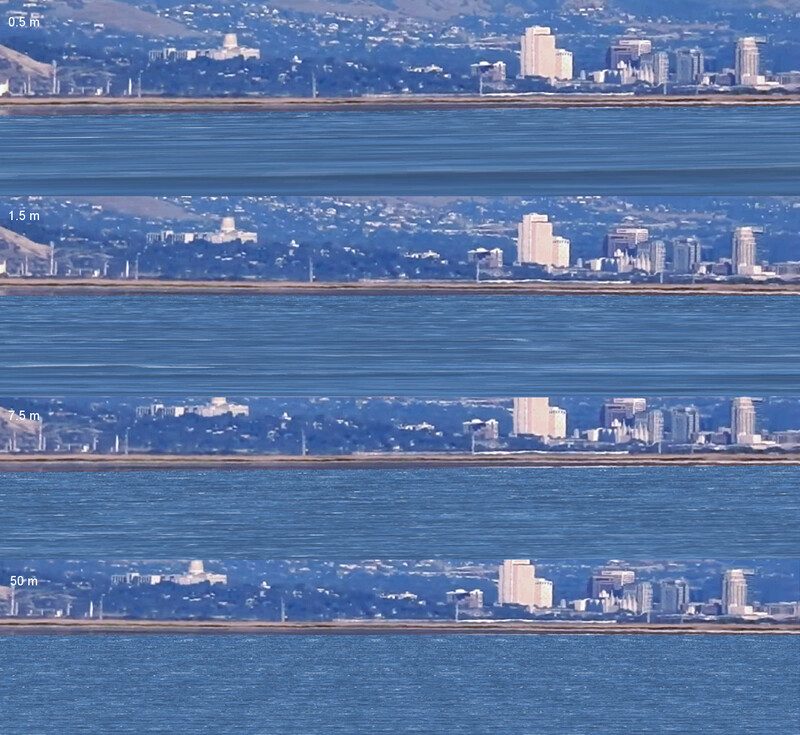 City observed and simulated at observer heights of 0.5 m, 1.5 m and 7.5 m. The bottom image part is from another location and higher up to show that the city is about 100 m above the Salt Lake. 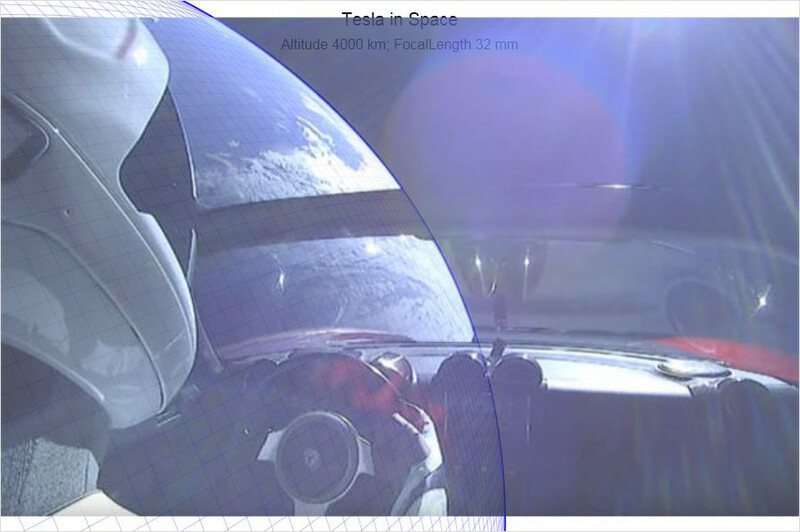 Note that the simulation took the bottom image as the background. 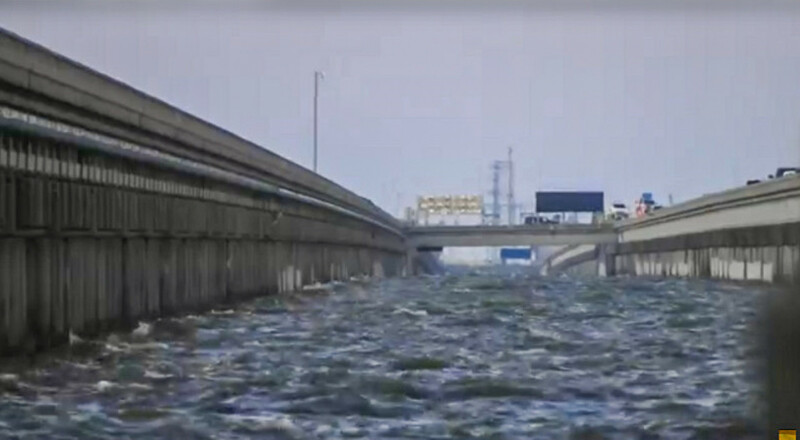 Because this image is taken from a different angle and zoom than the top 3 real images, the viewing angle and zoom to the buildings in the simulations do not match the footage. But the hidden parts do match because the vertical scaling of the buildings is the same in the simulation as on the footage. Because the refraction was not known I had to try to find a refraction curve that matches the footage. I found that the water was probably slightly warmer than the air and some Stooping was goeing on. The Simulation shows, that no matter whether you chose zero Refraction, Standard Refraction or the Refraction Curve I used, there are always some parts of the bottom of the city and the buildings hidden from 1.5 m to 7.5 m. Only the amount and the distortion changes slightly. Please try the Refraction Simulator yourself. View to the Comcast Skyscraper of Philadelphia (gray building left of the crosshair) through the Auto Level of Jesse Kozlowski (a Geodetic Surveyor ) from on top of Apple Pie Hill (62 m) Fire Tower (18 m) in southern New Jersey . 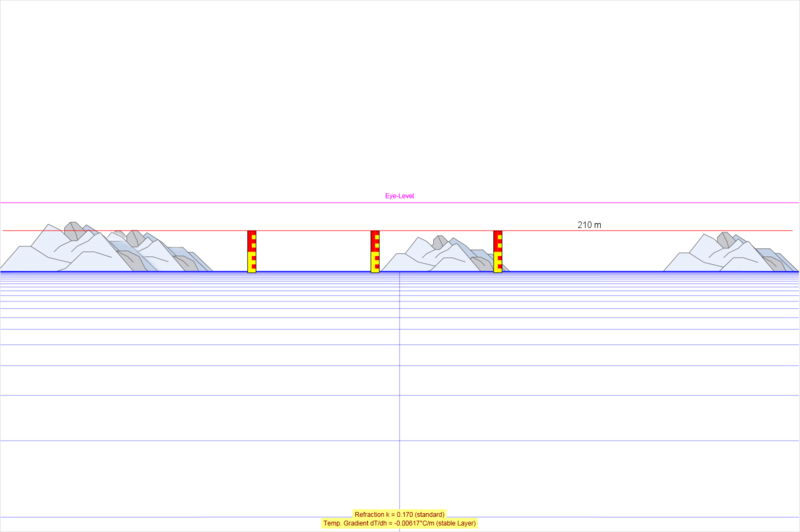 The horizontal crosshair is at auto level elevation of about 78 m (256 Feet) NAVD88 and shows the Eye-Level plane from the observers location. 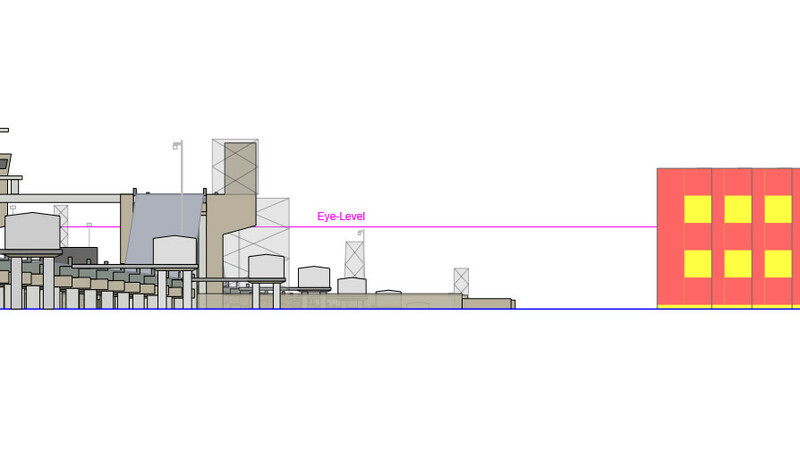 The Eye-Level plane is perpendicular to the vertical at the observer location. 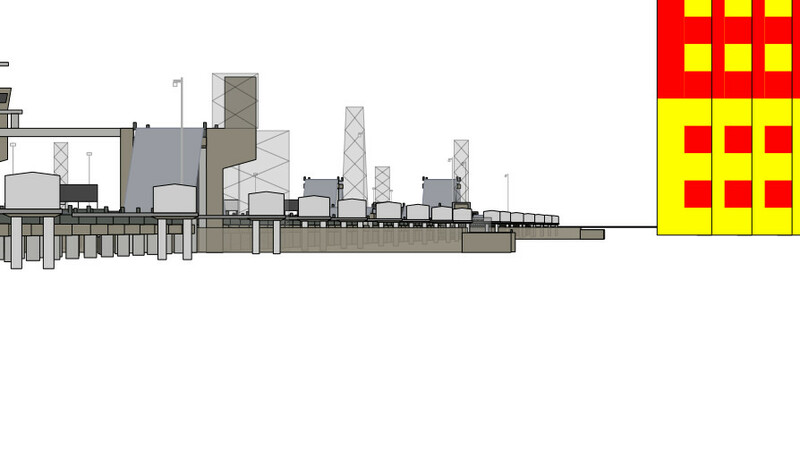 The distance to the top southeast corner of the Comcast Center is 52.15 km (171,100.8 Feet = 32.4 Miles). 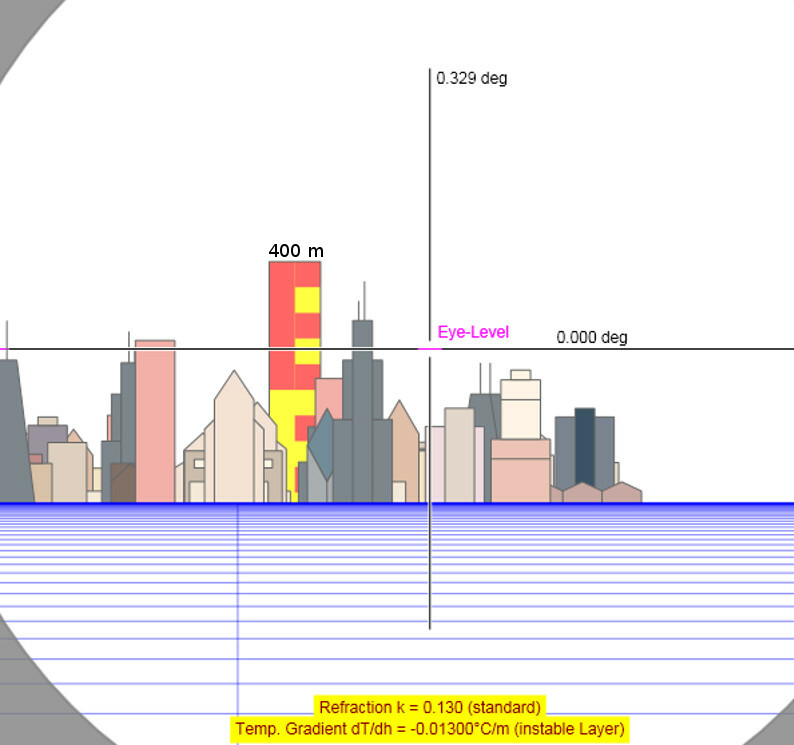 The top of the skyscraper is at elevation 307.85 m (1010 Feet) NAVD88. 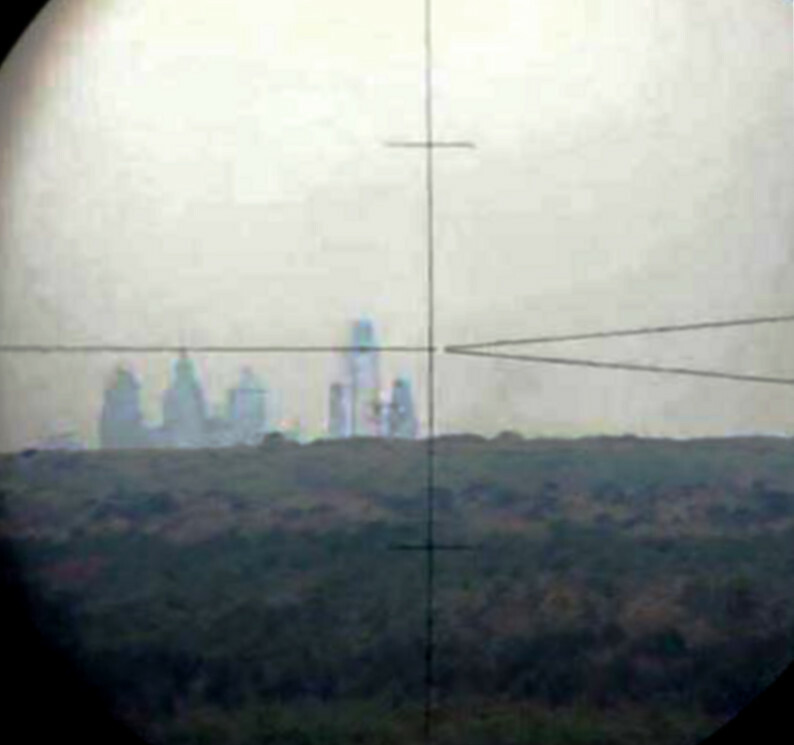 The crosshair (Eye-Level Plane) intersects the Comcast building at approximately 42 m (138 feet) +/- down from the top at 266 m (873 Feet). This is because the earth curves down. 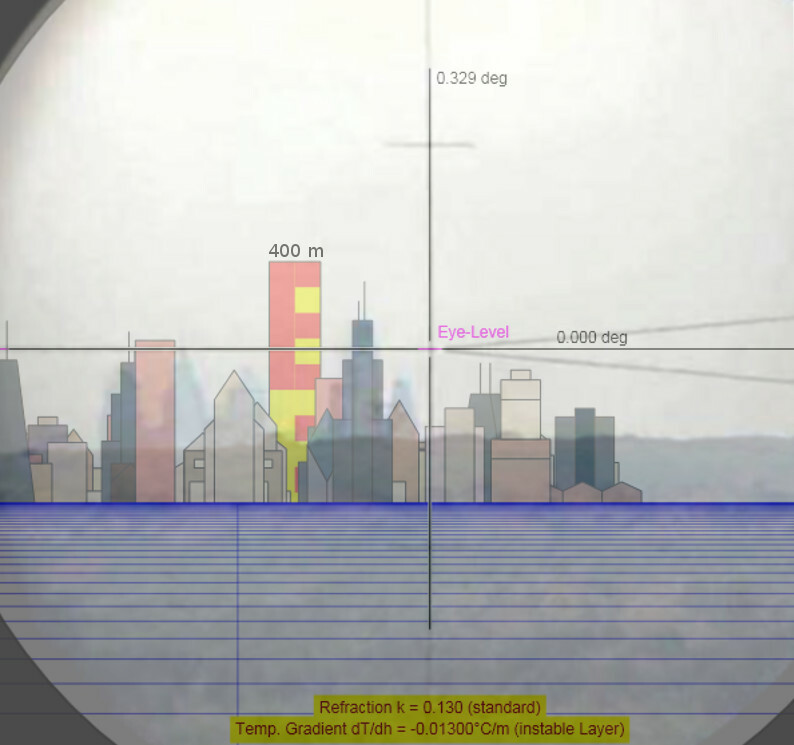 On a Flat Earth the crosshair (Eye-Level Plane) would intersect the building at Eye-Level altitude of 72 m, that is about 2 scales from the bottom on the measuring rod..
A Refraction Coefficient of k = 0.13 is applied on the Globe Model, which corresponds to Standard Refraction over land. 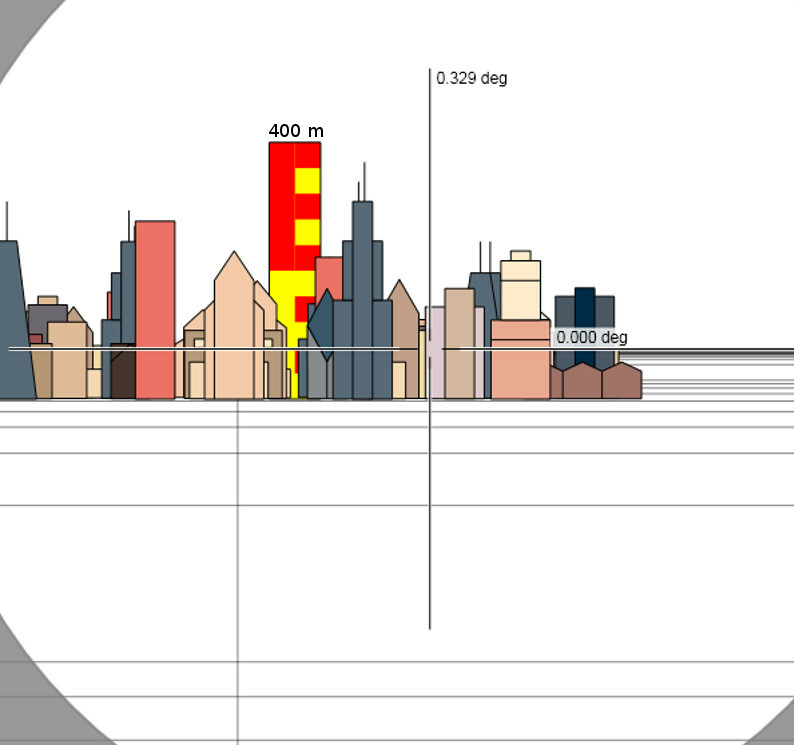 The yellow/red measuring rod in the model is 400 m tall with a 40 m scaling. 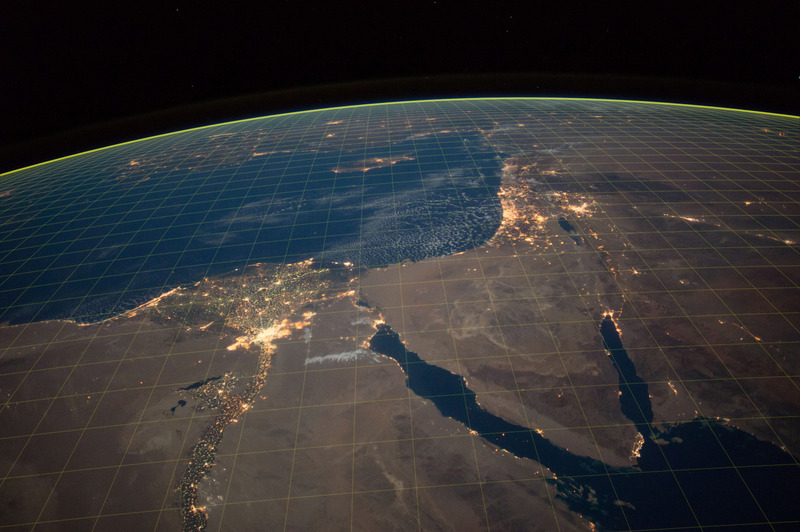 The horizon on the Globe Model is at a distance of 33.8 km (21.0 Miles) and has dropped 156 m (512 Feet) from Eye-Level or 78 m (256 Feet) from sea level corresponding to a Dip Angle of 0.264° from Eye-Level. This image was taken by one of the astronauts Sergey Ryzhikov, Shane Kimbrough, Andrey Borisenko, Kate Rubins, Commander Anatoly Ivanishin or Takuya Onishi on board of the ISS Expedition 49 using a NIKON D4 camera using a 28 mm wide angle lens (35 mm equivalent, no fisheye). Links to the original image and all EXIF data are provided. 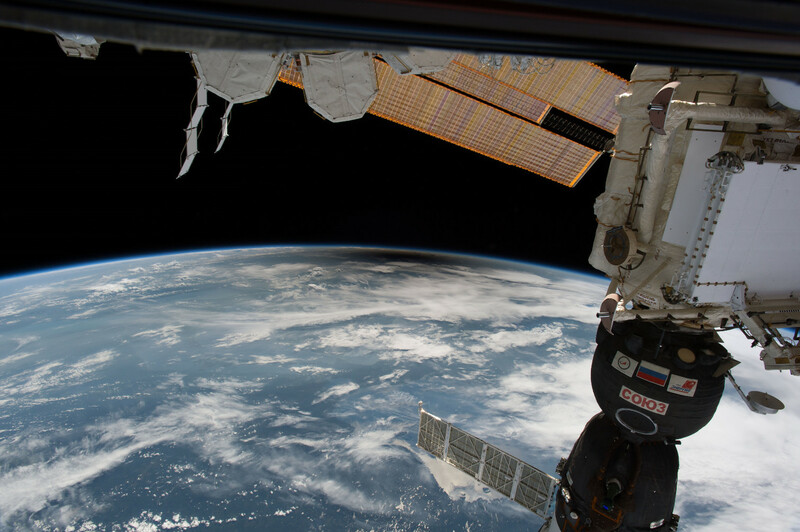 Another picture taken from the ISS showing penumbra from the solar eclipse. This image shows the moon's shadow (penumbra) from the solar eclipse on Aug. 21, 2017. It was taken by one of the astronauts Randy Bresnik, Jack Fischer, Peggy Whitson, Paolo Nespoli, Commander Fyodor Yurchikhin or Sergey Ryazanskiy using a NIKON D4 camera using a 20 mm wide angle lens (35 mm equivalent, no fisheye). Links to the original image and all EXIF data are provided. Flat Earth rest in peace! 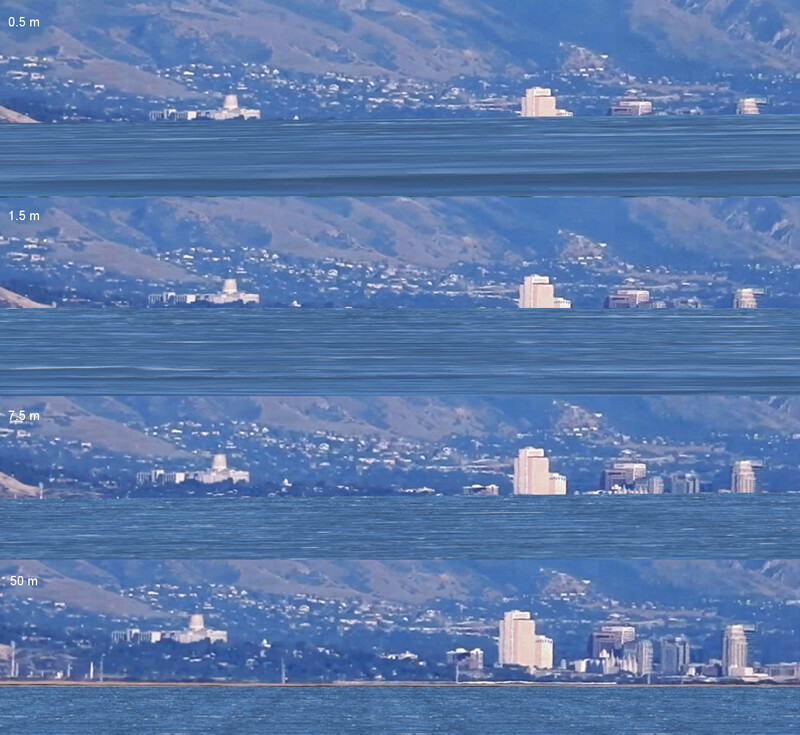 why on flat earth skyline starts from eye level?? wtf with u? and where is perspective, dude? Skyline on FE starts from eye level if your eyes are near the ground. 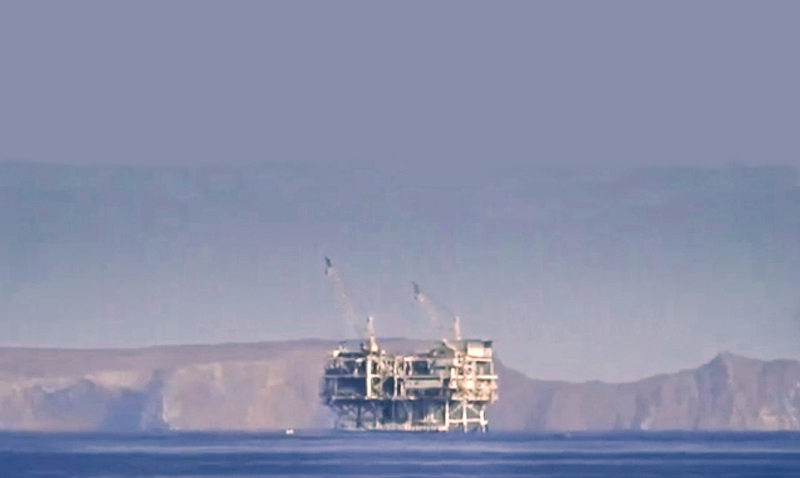 As higher you go, the lower the skyline appears with respect to the horizon line, depending on the distance to the skyline. 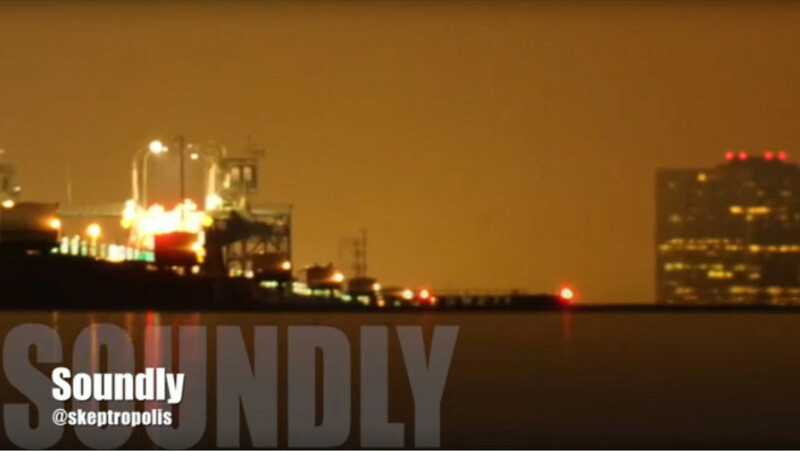 Check out Flat-Earth: Finding the curvature of the Earth. Perspective is built into the model. 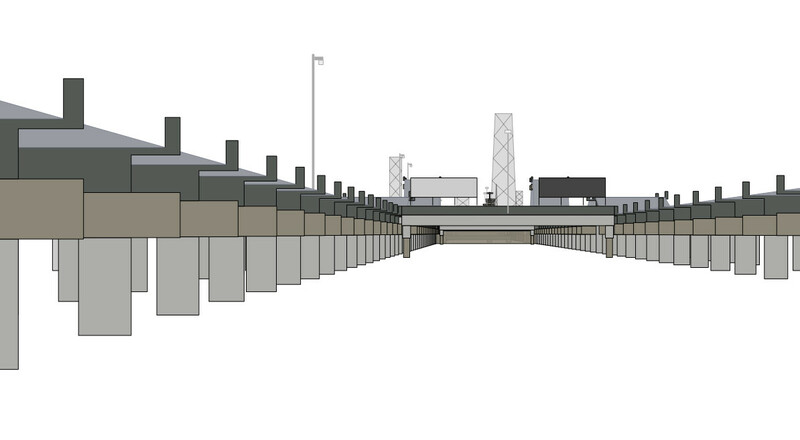 In fact the model is based on perspective. Perspective says, the angular size of objects decreases with distance, so they appear smaller. But you can zoom in to magnify the object to any size, depending on the zoom capabilities of your device. Walter, you have impressed me in every way imaginable with your flawless work! Keep posting evidence for the globe! Because the globe, is reality, and the space pizza, is a fantasy. Feine Arbeit! Hochgradig beindruckend, alles unter einen Hut zu bringen. Ich habe schon Probleme mit Google die notwendigen Formeln und Modelle zu finden, und das hier ist alles in einer Packung! Do you really think NASA and all astronauts use all the same camera for all images they ever take? Only because some of the images may be taken with a GoPro camera does not mean that ALL images are taken with a GoPro camera, agreed? 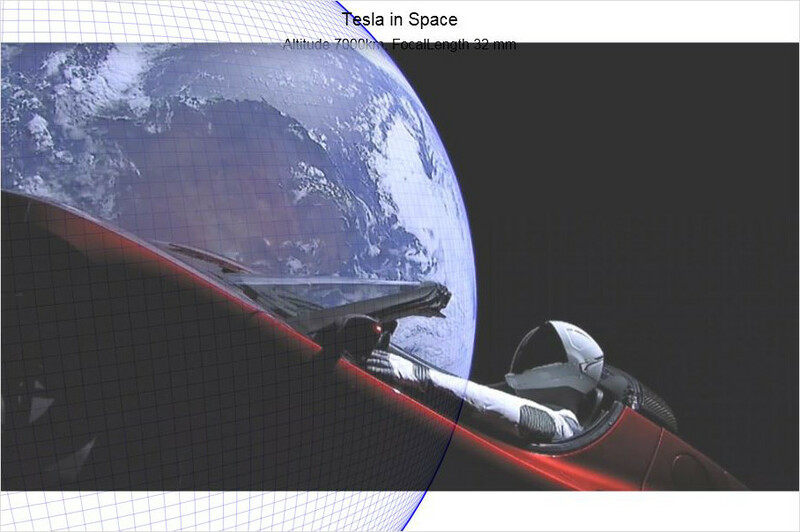 The linked article refers to a camera used at space walks, which have to record as much of the field of view as possible for documentation and review. For such applications it is common (on earth too) to use GoPro cameras with fisheye lenses. But the images of the earth are taken by full frame cameras with expensive non distorting lenses. NASA states on each image they publish what camera and lenses are used. This infos are embeded in the original images and I listed the relevant data below the images. I have chosen deliberately images that were not taken using fisheye lenses, because my App can not simulate fisheye lenses. You can go to the linked website, download the original full size image and see this embeded EXIF data yourself (right click the image and choose Properties). Note: I have replaced one of the images, because I could not find the original with the EXIF data embeded anymore. Gleem: it should show a flat horizon silly..
No it should not, silly. Did you ever make a calculation or at least a scale model? No, of course not because it could show that you are wrong. No I did not. I downloaded the original image from the NASA website, assuring that they were not taken with a fisheye lens, loaded it unaltered into the Curvature App, entered the altitude of the ISS and the focal length of the camera lens as listed in the embeded EXIF data, rotated and moved the calculated grid as is so that it meets the horizon of the image. The prediction of the Globe Earth Model from my Curvature App matches exactly what is photographed from the ISS. No deceitful manipulation done. And of course you ignore all other examples shown on this page, which you can go and observe yourself. That's right, Petitio Principii fallacy. You're using a sphere earth to prove a sphere earth. Why didn't you compute Terrestrial Refraction in your "Flat Earth Model" predictions? Certainly a Flat Earth has an atmosphere (or atmo-halfsphere). - When I click "Globe model", I see: Refraction k = 0.250 (medium) with a Temperature Gradient of dT/dh = 0.00655'C/m. - When I click "Flat Earth Model, there is no terrestrial refraction at all, so you're assuming there is no atmosphere and flat earthers live in a vacuum! Certainly these errors were made on purpose, to support your preferred view of the world. Einstein did the same exact thing when he invented Length Contraction, Time Dilation, and Mass Increase. It was all to support his preferred view of the world- a heliocentric model. Obviously you're smart enough to know this, but the radius of a flat earth is 0 and it does have an atmosphere and thus terrestrial refraction. 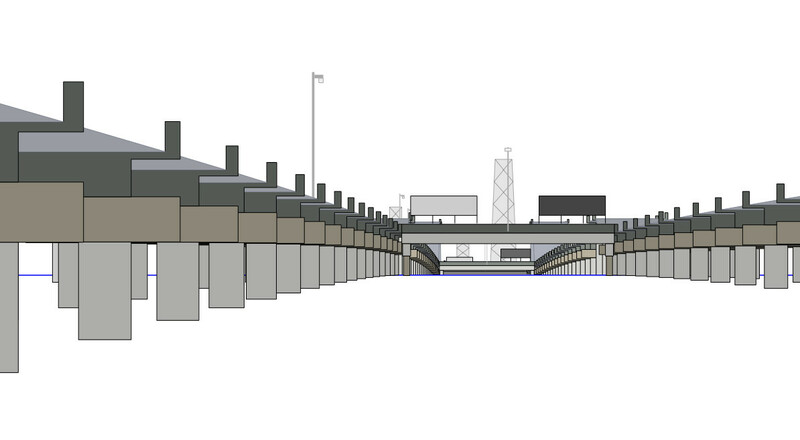 However, I congratulate you on your Curvature App and your work here- it's very well done. Thank you for proving open source code. Spill The Truth, this is not the assumed radius of the earth. This is the Apparent Radius of the Earth R'. A convenient method to show the effect of refraction on visibility is to consider an increased apparent radius of the earth R'. Under this model the light rays can be considered straight lines on an earth of increased radius. Click here and then change the RadiusPlanet parameter. The image and the model prediction can only be matched if you enter a radius of about 6371 km, which is evidence that the earth is a globe about this big. You can not make the flat earth model match any image, so the flat earth model is falsified, if we assume the known properties of light and atmospheric refraction, which we do exactly. The reason why I do not simulate refraction on the flat earth model is simply a geometrically restriction of the model. I would have to produce a concave earth. But anyway. Refraction on a flat earth can not produce images which show curvature as observed. Refraction can lessen or exaggerate the curvature of the earth, but not produce this amount of curvature on the flat earth. This simulation shows that to produce the pictures we can observe, with refraction, on the FE, you would need a temperature gradient of about -15°C per 100 m all the way up to space, which is physically impossible. Click the blue demo button FE Curved to see this simulation. Use the Intro button for a quick intro to the App. Certainly these errors were made on purpose, to support your preferred view of the world. So you call me a deceiver? Did I hide anything? Did I fake the images? You can go to this locations yourself and make the observations. Before you don't do that, be careful what you call me. And if you are not satisflied with my simulation, make your own and show me how observations match flat earth predictions. You may even use my code as a starting point to save work. Good luck. Einstein did the same exact thing when he invented Length Contraction, Time Dilation, and Mass Increase. It was all to support his preferred view of the world- a heliocentric model. First of all, the theory of relativity has nothing to do with the heliocentric model at all. It is an accurate description of some observed properties of nature. Second, Einstein did not invent relativity. He only was the first person who found a single solution to many yet unexplainable and apparently contradicting observations. The theory is based on and describes observations. Time dilation, length contraction, mass increase, invariance of the speed of light, bending of light and time dilation due to gravity, ect. are observed facts! Electromagnetism would not exist, and as a consequence no atoms would exist, if the theory of special relativity was not right. Today we have so many application that would not exist if we would not have discovered the laws of nature the theory of relativity describes. ...and so called "Chronometric Leveling", a rather modern surveying method based on measurements of Gravitational Redshift as per the Theory of Relativity. Herzlichen Glückwunsch zu dieser ausgezeichneten Internetseite! Ich wünschte, es gäbe einen Award für Dich. Fast alle Flat-Earth-Debunker-Kanäle auf Youtube berufen sich auf Dich und Deine hervorragende Arbeit. 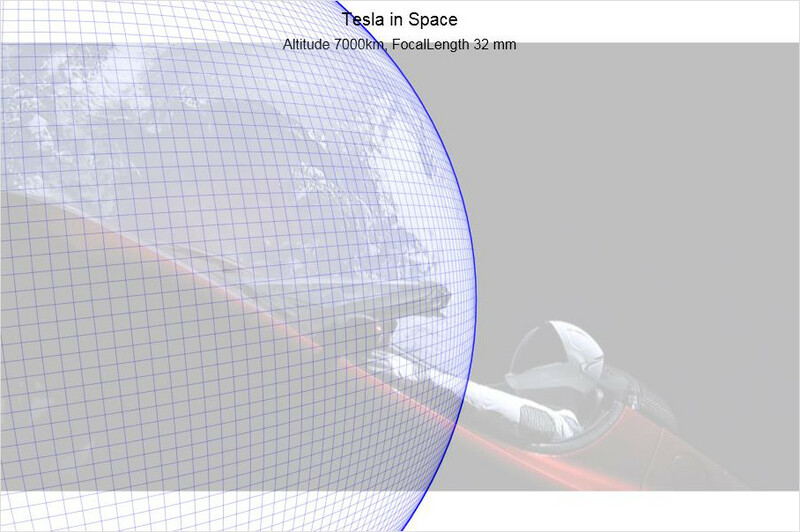 Du nimmst sogar den Flat-Earthern die Arbeit ab, ein eigenes Modell zu entwickeln (personal atmospheric dome), und die haben das anscheinend gestohlen *) und es zu ihrer eigenen Erfindung gemacht, ohne zu merken, dass es nur für einige Beobachtungen und unter haarsträubenden Annahmen über die Physik der Lichtbeugung und -brechung funktionieren würde.
) Ich beziehe mich hier auf ein Video auf Youtube mit dem Titel "Flat Earth Jeran & His Little Secret - One More Nail in the Intellectual Frauds Coffin" (etwa bei 7:20 min), das ich leider nicht verlinken kann. Danach hat Jeranism "seine Idee" eines atmospheric dome zum ersten Mal vorgebracht, kurz nachdem Du Dein Modell vorgestellt hast. "This entire webpage is guilty of the Petitio Principii fallacy. Every single "Globe Model Prediction" uses math which assumes the earth's radius is 6371 km"
It's not an assumption. It's a measurable fact. It's also not Petitio Principii if you make predictions based on a model and find that they match reality. If the Earth were not a sphere of radius 6371 km, then reality would not match the predictions of the model, and the model would be falsified. It's perfectly non-circular deductive reasoning. Peititio Principii is much better demonstrated in Flat Earth reasoning, e.g. "all photos of Earth from space are all fake because I know the Earth is flat, therefore all photos of Earth from space are fake". Citing logical fallacies in Latin is only impressive if you actually know what they mean. Sehr schöne Seite, saubere Darstellungen und klare Fakten! Herzlichen Dank für Ihre Arbeit und beste Grüsse. As long as the heights are much smaller than the radius of the earth, this approximation is very accurate, at least 3 decimal places accurate if observer and target height are less than 6000 m.
The same equations can be used to calculate the distance with and without refraction. You simply have to choose the corresponding value for R. Because under standard refraction the earth looks less curved, you can use a bigger radius for the earth than it is in reality. For standard refraction 7/6 · Rearth use R = 7433 km. For standard refraction k = 0.17 use R = 7681 km. There are multiple slightly different values for standard refraction in use. Near the ground the bigger value is more accurate. For higher altitudes the smaller value is more accurate. If you press the button Std the Advanced Earth Curvature Calculator calculates refraction depending on the observer altitude. Near sea level refraction is about k = 0.17. Note: for observer and target height much less than the radius of the earth, the line of sight distance and the surface distance are identical for all practical purposes. So the equations above hold for both cases. You can also use my Advanced Earth Curvature Calculator to interactively setup a scene and get the values from it. Would you please put more images on this page to compare them with flat and globe earth models? What is the luminous halo which seen above the some of earth pictures taken from ISS? Amir, from time to time I include more examples on this page. Do you have any suggestions? I'm not sure what you mean by luminous halo. Is it something like in this picture? This is the Aurora , also called polar lights, northern lights (aurora borealis), southern lights (aurora australis). "Auroras are produced when the magnetosphere is sufficiently disturbed by the solar wind that the trajectories of charged particles in both solar wind and magnetospheric plasma, mainly in the form of electrons and protons, precipitate them into the upper atmosphere (thermosphere/exosphere) due to Earth's magnetic field, where their energy is lost. The resulting ionization and excitation of atmospheric constituents emits light of varying color and complexity. The form of the aurora, occurring within bands around both polar regions, is also dependent on the amount of acceleration imparted to the precipitating particles." No sir. Please look at the first picture of earth from the left on this page. A dim luminous halo is seen above the earth. What is it? Amir, oh, I did not notice that. This is called Airglow . It's caused by the recombination of ionized atoms (plasma) with free electrons in the Ionosphere . The greenish color is from the recombination of ionized oxigen with electrons in about 100 km altitude. Bill, I assume you know the earth is a globe. But I want to give some infos about GPS anyway. Actually on the heart of GPS it works in Earth Centered Earth Fixes (ECEF) cartesian coordinates . This is a coordinate system with the origin at the center of the earth, the X axes pointing to the 0-Meridian at the equator, the Y axes pointing to 90° east at the equator and the Z axes pointing up to the north pole. The coordinate system rotates with the earth. All satellite positions are given in so called Kepplerian parameters, which describe the orbits of each satellite. GPS receivers calculate from this parameters the current locations of all satellites in view in ECEF coordinates. From at least 4 satellite positions in ECEF coordinates and the travel times of the signals from this satellites to the receiver, the location of the receiver is calculated in ECEF coordinates by Multilateration . So the positions calculated by GPS receivers are independent of the shape of the earth. They work for locations in space as well as for locations on earth. GPS is also used by some space probes and satellites to measure their positions in space. 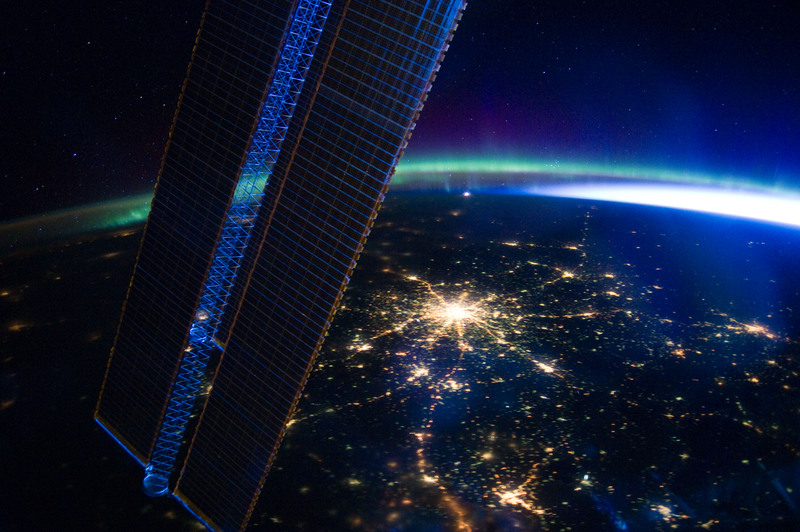 The ISS uses GPS to determine its position and its orientation. The method of Differential GPS is used during rendezvous to determine the range between the ISS and the visiting vehicle. (source Quora ). Only for navigational purposes on earth this coordinates are converted to latitude, longitude and ellipsoid height. The ellipsoid height is further converted into elevation above mean sea level using the Geoid model (Earth Gravity Model 1996, EGM96 ). The ellispoid coordinates are equivalent to the ECEF coordintes. They describe exactly the same locations in space. You can transform back and forth between this coordinate systems. If you measure many points on the surface of the earth in ECEF coordinates and plot these points in a 3D application, you get the real shape of the earth, which happens to be a sphere, not a plane. Of course, because otherwise we would not even have the GPS satellites orbiting the earth. The ellipsoid coordinate system is chosen because the earth is approximately an ellipsoid. If the earth were flat, a cylindrical coordinate system would be more appropriate. If you are at the north pole, the position in ECEF coordinates is (0, 0, 6,356,752.314 + your height). This is equivalent to latitude = 90°, longitude = 0° and h = your height. If you would use cylindrical coordinates for the flat earth, your coordinates would be: latitude = 90°, longitude = 0°, height = greater than 6,356,752.314 m.
Here is a plot of a flight around the earth given as ECEF cartesian coordinates. All points lie on tracks at the altidude of the airplane above a 3D globe. No globe assumed for any calculations. 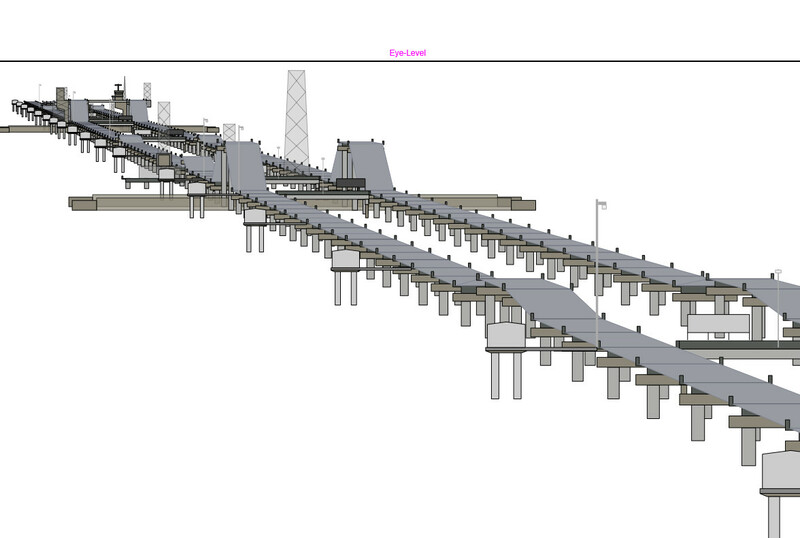 This are the raw 3D data calculated by the GPS receiver. If the earth were flat, all points would lie on a plane, not a globe. Note: all 18,857 3D coordinates are listed in the table at the end of the linked App. Raw ECEF cartesian coordinates, no latitude, longitude, no globe model assumed. You can measure the radius of the earth in this App by selecting any 3 points on the same altitude as shown in this picture .